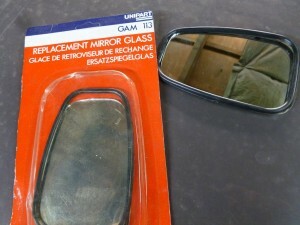 Desmo / Unipart 5inch wing mirror glass. We have acquired some stock of replacement glasses for these popular wing mirrors. These mirrors were manufactured by Desmo but also sold under the BMC and later Unipart brand labels. They come complete with the plastic retainer. Price: £11.95 each flat glass. £13.95 each convex glass.